The Grassroots Safety Leadership™ Series consists of three manuals to guide you through the safety culture change process implementation in your organization. This three-book series spells out the roles and responsibilities for managers, supervisors, coaches and employee team members involved in creating safety culture change through the Grassroots Safety Leadership process. Dr. Simon holds a Ph.D. in Clinical Psychology from Harvard University. Ms. Carrillo holds a Masters Degree in Organizational Development from Pepperdine University. For more information, please direct e-mail to: info@culture-change.com. 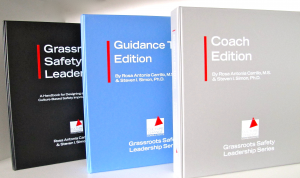 How and why does the Grassroots Safety Leadership™ methodology work? What is the role of the Guidance Team in the culture change process? How to implement the Grassroots Safety Leadership™ process. How does a manager lead and change culture? How to create the conditions for success. The nine critical ingredients for successful teams. The hidden causes of accidents. The powerful influence of culture in safety performance. Strategies that get employee involvement. Support rather than lead the grassroots team. Develop the grassroots safety team leader’s facilitation skills. Train team leaders to problem solve at a cultural level.